The definitive Coffee Axis Hotel Guide 2018, – is where we are going to help you create the type of travel plans your friends will be jealous of. The key to successful high energy efficiency travel is a good nights rest. Without it, you might as well stay home and watch the Travel Channel. Here are a few places we felt that you might enjoy! If you are a hotel and you would like to be on the list, contact us via email pereiracityguide@gmail.com, to schedule our visit and learn more about how our content marketing system works. Like the cold ripple on a nordic lake, you will find exceptional peace and quiet, in a tropical savannah. If privacy and comfort are important to you, then do not overlook the deeply personalized service and quality offered here. With 24/7 on-site chef and private car service, proprietors Jorn and Nohra Ludvigsen will ensure your comfort and convenience. This place revolves around food, it is part of passion behind the business. Guests are cared for on a plate-by plate basis, with the food formed to their tastes. Note: Typical Colombian food is not served here. The menu consists of curated tastes using recipes from Northern Europe and local ingredients. Relaxation is also important, with on-demand massage, spa and salon services to complement the well-appointed rooms. Only a few rooms are offered, with high quality imported Scandinavian beds, private bathrooms, room service and fine linen. Additional amenities include reading lights, NO electronic pollution, hot water in ALL taps. For your travel convenience, private car, driver and language assistance available on-demand. This is the only hotel in the Coffee Axis which can cater to eight different languages including Spanish, English, Portuguese (Br), German, Swedish, Danish, Norwegian and some French. One place, many things. That is the central vibe of this super-central party hotspot. On the hotel side, there are two Boutique style rooms with comfy beds, a desk, wardrobe and full bathroom. On the hostal side (which is one room), a group can rent the 4 beds available and have their own little loft to crash in for their visit. One place, many types of atmospheres. In the afternoons, this is a co-working cafe space with a coffee bar. This place welcomes digital nomads to come in, focus and work hard. As evening comes people trickle in for their delicious hamburger and sandwich menu, a cold beer, or even a gin and tonic – as they finish their workdays. Before long, the DJ booth gets going and as evening turns to night, it becomes a party scene for rap, hip-hop, reaggaeton, electronic music – or maybe even a jazz concert. Hotel Uno is one of the most-exciting new startups in Pereira. It has made a bold move in helping to transform an area that previously was famous for prostitutes, addicts and crime. Slowly the neighborhood is seeing the potential as an upscale historic district which brings a variety of options to the Pereira nightlife. Investors are taking a lot of interest in developing this area, in part, due to the success of Hotel UNO and their many events and offerings. Wake up in the midst of all the action Pereira has to offer. Enjoy your morning coffee while looking out over the most beautiful plaza in Pereira, Parque Libertad. Situated close to super markets, cinemas, shopping malls and English institutes. Plus, it’s only a few blocks from the financial district. You won’t find a hotel so well priced for the placement anywhere else. This is a mid-level business class hotel that recently underwent a remodel. Now you can stay close to the action without breaking the bank. The site is clean with basic amenities which include a balcony social space, hot water, WiFi, room service 24/7 reception desk and private bathrooms. Located in el Centro, we recommend this place as a great “starter” option for long term visitors and recent arrivals who need a place to stay or live for a reasonable cost. Check with the front desk for current monthly rates. For one of the most famous touristic coffee farms in the region, Hacienda Venecia should definitely be on your itinerary. 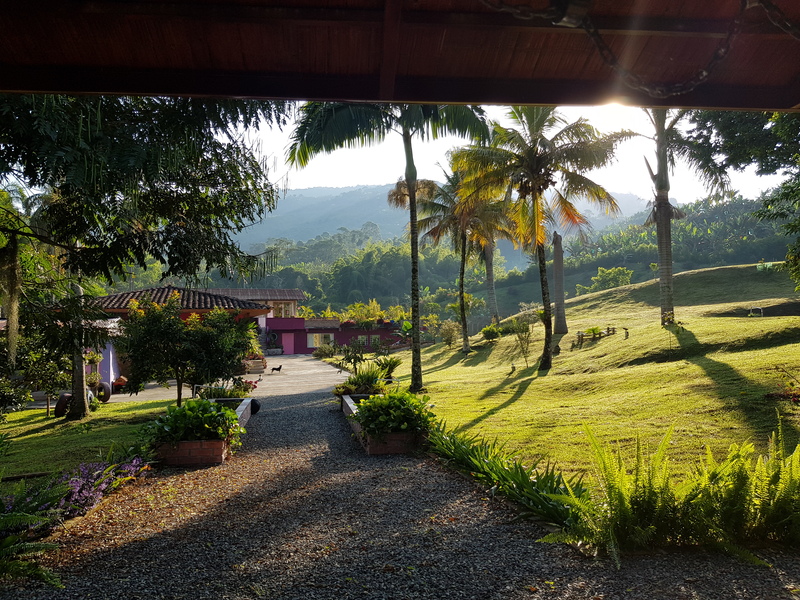 Nestled in the mountains leading to Manizales, it is a working coffee hacienda (or plantation) that has over 100 years of coffee tradition and has been in the family for 4 generations. As a working coffee farm they are dedicated to sustainable practices, which include a UTZ certification. They were the first in Colombia to apply the cultivation and commercialization processes required to achieve this certificate. They are currently exporting to Japan but have previously exported to Switzerland, Holland and Belgium. The coffee lodge is a great option for families who want both comfort and privacy. Featuring a variety of tours and activities, you could pass your entire vacation on-site and not want for anything. 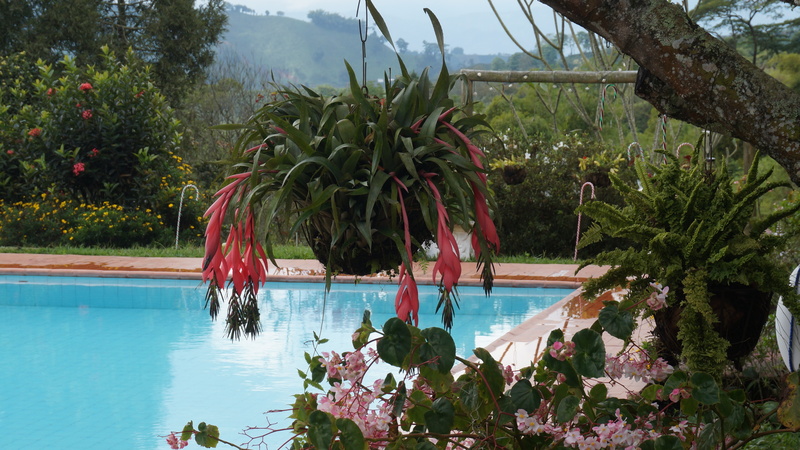 There are three lodging options which include the main house, coffee lodge and hostel. Amenities include WiFi, pool access, hiking trails, free coffee 24/7, group activities, tours, personalized service and options. Eat the traditional cuisine of the coffee axis in their on-site dining rooms. Relax on a quiet porch and read a book or soak up the mountain scenery. At night you will hear the sounds of nature and during the day the sound of a working farm. This farm has a special significance in coffee axis history. In 1997, the family patriarch passed away leaving the operation to his daughter Maria Teresa and her husband, who was quite sick at the time. 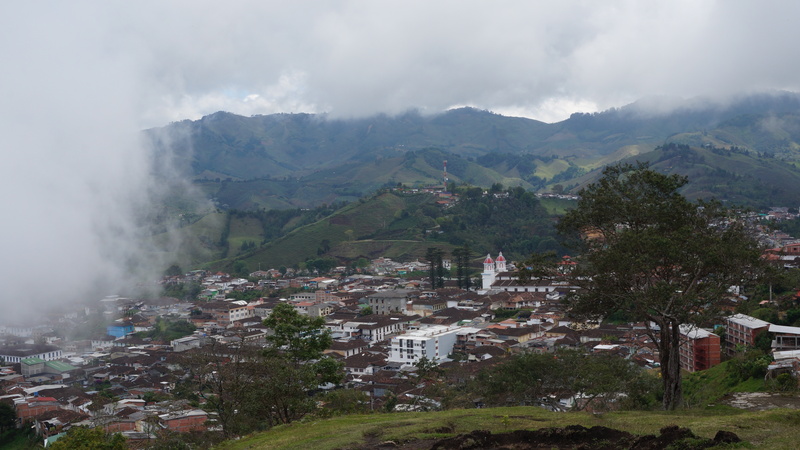 With her sons all in college, tough decisions had to be made: sell the house in Manizales, or sell the farm. The house was sold and the farm was kept – with a new vision. Hacienda Guayabal became a pioneer in the concept of coffee tourism with the first touristic coffee tour and lodging offer of it’s type. In the beginning, visitors were few and far between, and international coffee prices were down. Gradually their persistence paid off. They even have a unique microclimate and a profusion of birds, with more than 100 different avian species inventoried on the farm. Visitors can enjoy coffee tours which include planting, production, harvesting, processing and tasting. Rooms feature orthopedic mattresses, private bathrooms and great views. This is also a great destination for the whole family – with a playground, playhouse and a swimming pool, you can bring the kids and find fun activities for them too! Are backpacker hostels more your thing? Then check out our 2018 Hostel Guide for the 3 best hostels in the Coffee Axis! Aguadas is home to the “Sombreros Aguadeños,” a type of Colombian hat made from the Iraca Palm. These hats are super fine and have been exported worldwide in a artisan tradition that spans many generations of this coffee axis pueblo. Visitors can even see and visit the artisans at work during the week. Attractions in this beautiful pueblo include, scenic hikes, gastronomy and historic tours of the city. Be sure to visit “Casa de la Cultura,” a museum dedicated to the traditions of the sombrero makers and the history of the pueblo. Ask for the director Juan Manuel, who offers an excellent historic tour of the city including scenic overlooks and accurate descriptions of historic events. Spoiler Alert: Aguadas, Caldas is our #1 Offbeat Destination for 2018…more to come soon! 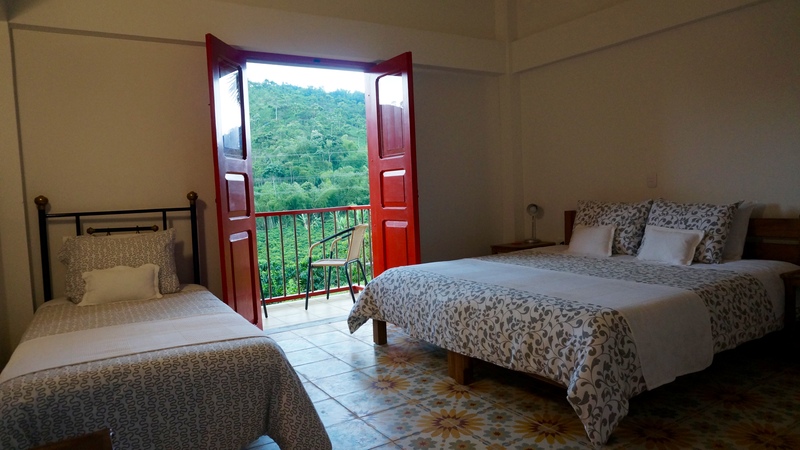 Casa Cardona is a beautifully decorated, fully stocked self service guest house located only one block from the main plaza and close to everything. Amenities include on-site maintenance, daily cleaning and meal preparation, as needed. 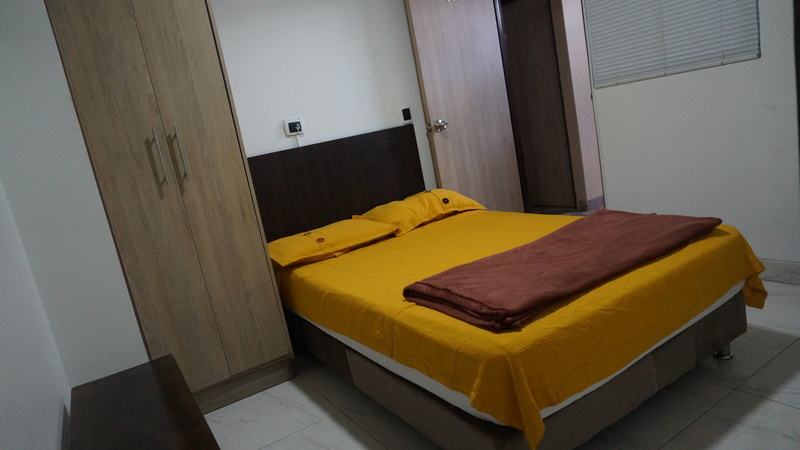 The concept of this boutique style guest house, is self-service and which specializes in group accommodations. You won’t find better privacy or placement anywhere else.We would not be at all surprised if this house is one day turned into a full service bed and breakfast with on-site staff. Be sure to pack a jacket for your visit because this pueblo can be a bit chilly at night. Take note of this lesser-known destination because it is the best-kept secret in the coffee axis. This place is tailored to the interests and desires of the intelligent, discerning and open-minded traveler. Adriano, the owner, apart from being a coffee farmer and professional artist, is a European trained chef who will create for you an experience that is one-of-a-kind. With distinctive dishes influenced by European cuisine and using locally sourced ingredients, prepare for something unique yet ultra-gourmet. Activities include explanation and experience of coffee production and processing, empanada cooking classes, birdwatching and jeep tours, depending on the interests of the guests. A great place to go and relax with friends, enjoy a honeymoon, or take a working vacation in an place that will inspire your creativity. Local birdlife is abundant in the gardens and includes frequent sightings of the Barranquero Coronado. The bedroom suites also double as a gallery for Adriano’s art, with accent lighting, carefully curated themes and colors, you will feel like you are in a magical world of privacy and seclusion. Amenities include WiFi, Direct TV, jacuzzi, hot water and high quality mattresses. This exclusive guest house has limited spaces and high demand. Potential guests should book well in advance (with a mandatory deposit) to ensure availability. For a personal experience full of gourmet cuisine, mountain views, locally grown ingredients and a whole new level of comfort, we hope you find this one unforgettable. This is a short list of carefully curated hotel sites which we hand-selected and visited to ensure the best possible quality to our readers. Most importantly, these are local business which are committed to eco-sensible practices, local products and social responsibility. For your next vacation, skip the overpriced corporate hotels and go to a place where each guest is treated like a member of the family.